View/download our current recycling rate sheet here. In 2010, our corporate office and tree service division (The Professional Tree Care Company) moved into our brand new office building- built mostly from wood milled by Green Waste Recycle Yard from locally salvaged logs! Species we recycled into the building include Douglas fir and Monterey pine for framing, Coastal redwood for exterior siding, Monterey cypress for our facade lathe screen and for cabinetry, Blue gum eucalyptus for flooring, and Claro walnut for countertops. To see some photos, please check out this Facebook album. Green Waste Recycle Yard & Millworks is the San Francisco Bay Area's premier resource for recycling salvaged urban trees. 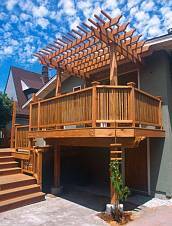 The Professional Tree Care Company is our sister tree service, offering completed professional tree care services throughout the greater Bay Area since 1980. 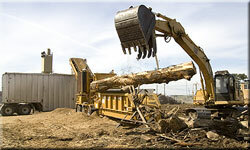 Unlike most tree removal services which chop trees into small rounds, The Professional Tree Care Company uses cranes to remove trees as long logs whenever possible, insuring the highest possible level of reuse. 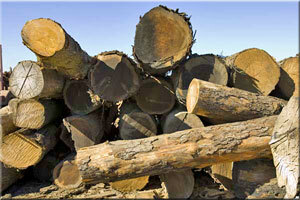 PTC recycles 100% of logs and trimmings through Green Waste Recycle Yard. Green Waste Recycle Yard products have a naturally low carbon footprint because we source, manufacture, and distribute locally. 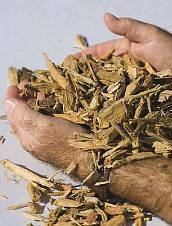 Further, by saving logs and trimmings from anaerobic decay in landfills, we reduce the production of potent greenhouse gases like methane and nitrous oxide. In 2016, Green Waste Recycle Yard diverted over 17,000 tons of green waste from the landfill! To learn how to design, construct and maintain sustainable landscapes for the San Francisco Bay area, please click the Bay-Friendly Landscaping logo above. 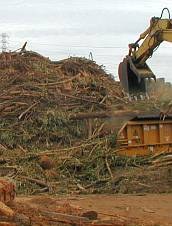 ©2014 Arboricultural Specialties, Inc. dba Green Waste Recycle Yard. All rights reserved.